Factoid # 56 – On June 18, 1812 Britain declared war on the United States and the 100th Regiment of Foot prepared for battle. Six years later, in July 1818 the disbanded soldiers and their families left Quebec City to begin their long journey to the wilderness called the Richmond Settlement. 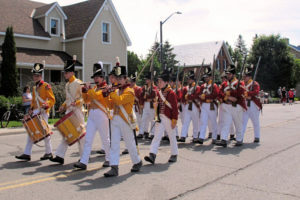 This past weekend, June 15-17, the village celebrated 200 years of history. Congratulations to the organizers and volunteers who made the weekend such a success. The highlights were many and it didn’t rain on Richmond’s parade! A special thanks goes to the members of the Goulbourn Township Historical Society, the military bands, and the re-enactors who brought both our military and civilian heritage alive. The planning of tours, creation of costumes, researching of historical figures and buildings, and writing of scripts required the efforts of a willing army. Well done by all! Factoid #57 -We see the first mention of THE missing guns in 1820 when Governor General Lord Dalhousie wrote that he had ordered “200 stand of arms and two light field pieces” to be placed in Richmond. In March 1822 Lord Dalhousie complained to Sir Peregrine Maitland that “The two Guns for Richmond have been lying at Philemon Wright’s since last June.” Eventually they arrived. These armaments had been requisitioned so the soldier/settlers had more than their own muskets for protection in case of an American attack. In the winter of 1837-1838 the guns were used by an Artillery Company led by Edward Malloch and Sergeant Henry McElroy. In fact the guns had quite a history having been captured from the French by the British during the Napoleonic War, captured from the British by the Americans and then recaptured by the British in the War of 1812. Over the next decades Richmond tried unsuccessfully to reclaim its firepower. Even a century after the disappearance of the guns, Richmond residents, who had long memories, were lamenting their loss. Factoid # 58. The village had cottage industries about which very little is known. One such endeavour was the making of potash. In pioneer society, potash was useful to individual settler as it was a base ingredient in the making of soap. If made in large volumes it could be exported to Great Britain where it was used by several industries including the flourishing textile mills. So this little industry both provided a needed household product and a source of supplemental income. We see some evidence of this in early Richmond life. In 1832 Hugh Ronan made provision in his will for the disposal of his leaches, kettle, and any potash on hand. The proceeds were to be distributed among his five daughters. In a later period William Birtch made 37 bushels of potash in a year. Potash making required a source of hardwood – either beech or maple was preferred. The wood was burned and the ashes were placed in a container, which was often a barrel but could even be a hollow tree trunk. Covering them with water leached the ashes and the resulting mixture was collected. The mixture was placed in an iron kettle and the water slowly evaporated. What was left in the kettle was the “salt of ashes” or potash. Factoid # 59 – One of the industries, which flourished in the 1840s, was the making of leather. John Alfred Torney was said to be a “man of means” when he arrived in Richmond in 1822. He built a tannery on the northern bank of the Jock River at the end of Fowler St. and also operated a farm in the village. At some point he constructed a two storey log house at the corner of Fowler St. and York St. While the tannery is long gone, the house still remains and is the only example of its type still remaining in the village. The Torney enterprises seem to have been very prosperous. They supported 10 children and at times as many as 8 workers: tanners, apprentices, labourers and servants. The two eldest sons attended McGill University. John Jr. was involved in the construction of the first Telegraph line between Bytown and Montreal; Hugh became a lawyer in Bytown. The family continued to own the tannery until it was sold to Mr. William Hemphill in 1875. For the aging soldiers, some who had not adapted well to farming, these quarterly pensions paid for small luxuries: tobacco, tea, sugar and, of course, a pint of whiskey. This entry was posted in Events, industry, military, Personalities. Bookmark the permalink. Great Factoids #56-60 providing interesting historical insights not generally known or realized..